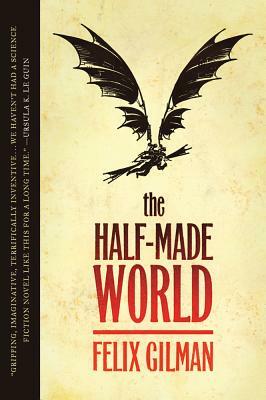 The world is still only half-made. Between the wild shores of uncreation, and the ancient lands of the East lies the vast expanse of the West---young, chaotic, magnificent, war-torn. Thirty years ago, the Red Republic fought to remake the West---fought gloriously, and failed. The world that now exists has been carved out amid a war between two rival factions: the Line, enslaving the world with industry, and the Gun, a cult of terror and violence. The Republic is now history, and the last of its generals sits forgotten and nameless in a madhouse on the edge of creation. But locked in his memories is a secret that could change the West forever, and the world's warring powers would do anything to take it from him. Now Liv Alverhuysen, a doctor of the new science of psychology, travels west, hoping to heal the general's shattered mind. John Creedmoor, reluctant Agent of the Gun and would-be gentleman of leisure, travels west, too, looking to steal the secret or die trying. And the servants of the Line are on the march. FELIX GILMAN has been nominated for the John W. Campbell and Locus awards for best new writer. He is the author of the critically acclaimed Thunderer and Gears of the City, and The Half-Made World, which was listed by Amazon as one of the ten best SFF novels of 2010. He lives with his wife in New York City.